The primary way to gather data for a Zen report is to provide an XData ReportDefinition block in the Zen report class. XData ReportDefinition specifies the data to acquire from the Caché database and describes how to format this data as XML. This XML becomes the source data for the Zen report. The next chapter, Formatting Zen Report Pages, describes how to generate the XSLT transformations that render the XML data for display in HTML or PDF format. This chapter describes how to format the source data as XML so that it can be input to an XSLT transformation. The following table lists techniques you can use to generate the XML data source for a Zen report. Provide a value for the DATASOURCE class parameter. DATASOURCE references an XML file that contains the data for the Zen report. If you provide a DATASOURCE value in the Zen report class, or the equivalent $DATASOURCE parameter in the URI when invoking the Zen report from a browser, you can omit the XData ReportDefinition block from your Zen report class. If you provide both, the DATASOURCE value takes precedence and Zen ignores any XData ReportDefinition that you provide. Write a class method in the language of your choice that writes out XML statements that comprise the complete source data for the report. Reference this method from the XData ReportDefinition block in the Zen report class using the call and callClass attributes on the top level <report> element. In this case, your XData ReportDefinition block consists of a single <report> element that provides call and (optionally) callClass attributes. <report> defines an SQL query or identifies the SQL result set that contains data for the report. <group> elements provides structure and organization for the output XML. A <report> or <group> may contain the following Value Nodes in any order or quantity. These elements provide the data values that appear within the structure specified by <report> and <group> for the output XML. <aggregate>  Calculates aggregates like sums and averages and outputs the result. <attribute>  Writes an XML attribute to the output XML. <element>  Writes an XML element to the output XML. A <report> or <group> may contain the following elements in any order or quantity. These elements provide XML from sources external to the current XData ReportDefinition block. <call>  Calls a method that returns a stream, and inserts the stream into the report definition at the place where the element occurs. This capability lets you create a report from separately-developed subreports. Note: <call> can be used only in a <report>, not in a <group>. <callelement>  Similar to <call>, but providing awareness of the data context where it is used. <get>  References the XML statements generated by the XData ReportDefinition block in another Zen report class. <include>  References a set of XML statements in an XData block in a Zen report class or in any other class. In expressions used by these syntax elements, the %val variable represents a field from the current query. The following figure shows the relationship between elements in the XData ReportDefinition block and the resulting XML representation of the data. On the left is the ReportDefinition block from ZenApp.MyReport in the SAMPLES database. On the right, is the XML generated by this ReportDefinition. A detailed explanation follows the figure. The top-level <report> element in XData ReportDefinition has a name attribute with the value myReport. This outputs a top-level container node for the XML output with the name <myReport>. The sql attribute supplies an SQL statement that gets data from the database. Inside the <report> container, each <attribute> element generates an output XML attribute that modifies its parent <myReport> node. The name attribute provides the name of the output XML attribute. In the example, these names are runTime, runBy, author, and month. The values of these attributes come from the corresponding <attribute> expression in XData ReportDefinition. In this part of the example, each expression runs an ObjectScript expression on the server to produce the value that appears in the generated XML. This example provides one <aggregate> element that is a direct child of the <report> container. It generates an XML element that is a direct child of the <myReport> node in the XML output. This element has the name <grandTotal> and appears at the end of the <myReport> container in the XML output, after any other attributes or elements that <myReport> contains. The <grandTotal> element contains a value. The type and field attributes of the <aggregate> combine to produce this value. The field attribute identifies the column in the SQL query for the <report> that supplies the data, in this example, Num. The type specifies the type of aggregation to perform, in this example, summation. The first <group> element adds an additional level of hierarchy. The name attribute provides the name SalesRep for the second-level container node created by the <group>. This <group> could provide its own data using any of the methods available to a <group>, but since it does not, it inherits the data definition of its parent container, the <report>. This means that any field attributes used in this <group> refer to the data populated by the <report>. The breakOnField attribute instructs the XML generation process to create a new node in the output when the value of the specified field changes. The result is a series of <SalesRep> nodes, one for each named sales rep in the result set. The <group> contains an <attribute> element, which generates an attribute that modifies each <SalesRep> node in the XML output. As previously described, name provides the name for the generated attribute, and field provides the value. In this case, the attribute is called name and the value comes from the column SalesRep in the SQL query this <group> inherits from the <report>. The first <group> contains, a second <group> element provides a third-level container node for the XML output with the name record. <attribute> elements add the attributes id and number to each <record> node. This <group> also contains <element> elements which add elements to each <record> node. The name and field attributes in <element> function much as they do in <attribute>, providing the name and value for the generated elements. The first <group> also contains <aggregate> elements which generate XML elements that are children of the <SalesRep> node in the XML output. These elements have the names count, subTotal, and avg. Each aggregate element contains a value. The corresponding <aggregate> type and field attributes combine to produce this value, as described previously. %val is a special variable that you can use only in an XData ReportDefinition block. All XData ReportDefinition elements support %val in attributes whose values are ObjectScript expressions: expression, breakOnExpression, and filter are the primary examples. %val can be single-valued or multidimensional, as the following topics explain. Because the value of the expression attribute is an ObjectScript expression, the previous example can use the ObjectScript functions such as $EXTRACT ($E) or $ZCONVERT ($ZCVT) to format the data contained in the resultset field called SalesRep. <report> and <group> support %val in breakOnExpression to represent the value of the breakOnField field. <report>, <group>, <element>, and <attribute> support %val in filter expressions. In this case %val represents the value of a field from the fields attribute in the same element, and may be multidimensional rather than single-valued. %val also works inside the ObjectScript code for custom aggregate classes. To do this for value nodes <element> or <attribute>, place a comma-separated list of field names in the fields (not field) attribute. Then refer to these values subscripted by their field name in the expression or filter attributes. These subscripts are case-sensitive. <report> and <group> also support multidimensional %val. The <report> or <group> must include a fields attribute for this feature to work. Use quoting conventions carefully. The expression value above uses double quotes effectively inside single quotes. The following example applies correct quoting conventions for %val subscripts and the letter G inside the single quote characters used to contain the filter value. The <report> element is the required top level container within an XData ReportDefinition block. A <report> contains zero or more <group> elements to organize the data for the report. When a report contains nested groups, each contained <group> is called a child of the <group> that contains it; the containing <group> is called the parent of the <group> elements that it contains. Multiple <group> elements may exist at each level of nesting, except at the top level, where there is only one <report> element. Any <group> elements that are contained within the same parent <group>, at the same level, are called siblings. A <report> requires a name attribute. A <report> can supply a query attribute to gather the data for the report or it can set the property runonce="true" to execute the report contents. A <report> cannot be nested inside any other element. A <group> contains zero or more <element>, <attribute>, and <aggregate> elements in any order. <element>, <attribute>, and <aggregate> elements may not be nested. <report> and <group> have the general-purpose attributes listed in the following table. Query attributes These attributes help you acquire the source data for the report. See the section Building the <report> or <group> Query following the table. Break on attributes The breakOnExpression and breakOnField attributes help you organize the source data for the report. See the section Break On Field or Expression following the table. call See Direct XML Attributes. callClass See Direct XML Attributes. The excelSheetName attribute lets you specify a name for the generated worksheet. By default, the worksheet uses Excel's default naming convention for sheets: "Sheet1", "Sheet2" and so on. Supply excelSheetName on <report> for a single sheet report, and on each <group> that defines a worksheet for a multi-sheet report. The excelSheetName attribute supports localization. See Localizing Zen Reports. If excelSheetName begins with a ! (exclamation point) the report interprets what follows as an ObjectScript runtime expression that is evaluated to get the sheet name. Sheet names supplied by runtime expressions are not localized. getxmlstylesheet The name of a method that returns a stream that contains the contents of an XSLT style sheet. This style sheet is used to perform transformations on the XML provided by the ReportDefinition block prior to processing by the ReportDisplay block. See Restructuring the ReportDefinition XML. This attribute is available only for <report> element. The <report> or <group> generates an XML element of this name in the output. If the supplied name is an invalid string for use as an XML identifier, the report does not work correctly. The most obvious characters to avoid are any white space characters, plus the five standard XML entity characters &'<>"
If the group is a <report> the name attribute is required. For a <group> the name is optional and the <group> generates a name for itself. The suppressExcelHeaders attribute lets you suppress all headers that are normally generated when you create an Excel spreadsheet from a Zen report. Specify suppressExcelHeaders="true" on <report> to suppress all headers, and on <group> to suppress headers for the associated worksheet in a multi-sheet report. xmlstylesheet A stream that contains the contents of an XSLT style sheet. This style sheet is used to perform transformations on the XML provided by the ReportDefinition block prior to processing by the ReportDisplay block. See Restructuring the ReportDefinition XML. This attribute is available only for <report> element. xmlstylesheetarg An optional argument to the method specified by getxmlstylesheet . A <report> or <group> requires a resultset to generate data. To obtain this resultset, a <report> or <group> can generate its own resultset by specifying a query. A <group> can also inherit the resultset generated by one of its ancestor <report> or <group> elements. A <report> or <group> supports the following attributes for specifying a query. fields consists of a comma-separated list of one or more of the field names from the resultset query. White space in the fields value is acceptable. For filter syntax details, including the %val variable, see the filter entry in this table. For additional information, see the discussion following this table. ObjectScript expression that determines whether or not the resultset row currently being processed should be included in the XML output for this <report> or <group>. When the expression evaluates to 0, skip that resultset row. In the filter expression, you can refer to the values of fields from the resultset query using the %val variable, subscripted with the case-sensitive names listed in the fields attribute for this <report> or <group>. For syntax details, see the The %val Variable section. A comma-separated list of fields used to override any ORDER BY phrase that is already present in the query for this <report> or <group>. If the first character in the orderby string is a ! (exclamation point) then Zen reports interpret the remainder of the string as an ObjectScript expression that provides the string. For further details, see The orderby Attribute in ReportDefinition following this table. For information on using orderby in the ReportDisplay section of a report, see The orderby Attribute in ReportDisplay in the chapter Displaying Zen Report Data. The name of the class containing the query. This attribute is used only if you also provide a value for queryName. The section Referencing a Class Query in the Zen Tables chapter of Using Zen Components provides information on using queryClass in a Zen page. The name of the class query that provides the %ResultSet. The class query must be projected as SqlProc. If you do not also provide a value for queryClass, the report assumes that the query is defined in the current report class. The section Referencing a Class Query in the Zen Tables chapter of Using Zen Components provides information on using queryName in a Zen page. Not specified, the <group> inherits the removeEmpty value of its parent. This is the default for any group that is not a <report>. The default removeEmpty value for a <report> is false. false, empty fields are retained in the group, and are output to the generated XML description of the data for the report. This is the default for a <report>, because <report> is at the top level, so there is no parent to supply an inherited value for removeEmpty. true, empty fields are omitted from the group, and are not written to the generated XML description of the data for the report. Not supported for Excel or xlsx output. When a <report> or <group> has its runonce attribute set to true, the <report> or <group> itself has no query. Instead, the <report> or <group> serves as a container for other groups that may each have their own query defined. If you supply a runonce attribute for a <report> or <group>, Zen ignores sql, queryClass, or any other query attributes that you supply for that <report> or <group>. Subgroups within that container may have query attributes defined. The default runtimeMode of 2 (DISPLAY mode) is appropriate for most cases and usually does not need to be changed. For more information about setting the SQL runtime mode for a query that returns a %ResultSet, see Queries Invoking User-defined Functions in the Querying the Database chapter of Using Caché SQL. Server-side SQL query to get contents of the <report> or <group> list. For additional information, see the discussion following this table. suppressRootTag suppressRootTag suppresses generation of the report root tag, which is otherwise generated from the name attribute of the report. Suppressing the root tag is useful if the report derives its XML solely through DATASOURCE, or the <include> or <call> elements, and the injected XML includes its own root tag. sqlexpression allows you to use a COS expression to provide an SQL query for the <table> or <group>. Note that Zen reports does not parse the resulting SQL at compile time. Studio does not assist you in creating the attribute value, as it does for the sql attribute. For more information, see The sqlexpression Property. Positive integer value. Has the same effect as a "SELECT TOP top" phrase in an SQL query, for example, "SELECT TOP 10". Causes the <group> or <report> to be limited to the number of results specified by top. The following example shows a fields attribute that selects two fields from the resultset returned by the sql attribute. Sample.Person WHERE Name > 'm'" fields="Name, SSN"
The sql attribute works in Zen reports the same way as it does in Zen <tablePane>, except that all Zen queries run in display mode and Zen reports support the runtimeMode attribute to control the runtime mode. Note that /* */ is the only comment syntax supported in the sql string. For details and examples using sql and query parameters, see the sections Specifying an SQL Query  and Query Parameters in the Zen Tables chapter of Using Zen Components. Any references to a field that does not exist returns an empty string (that is, "") rather than triggering a not found error. If a <report> or <group> has a query and contains an <element>, the value of the <element> prints out for each row that satisfies the query. When a <group> contains a query with parameters and its parent <group> is a sibling, the parameters refer to the values they have in the parent, which are the values they had in the first sibling in that parent’s group, before that first sibling encountered a break. When a group is a nested group, it gets a row of data for each row in its parent group, regardless of whether that row meets any break condition. That is, a parent group gives all its data to each of its child groups, whether or not a break condition has been met. A sibling group only gets data after a break condition has been met, and uses the data that existed in the row just before the break condition was met. If the siblings within a group contain <aggregate> elements, Zen recognizes aggregates on the first sibling in the group, and in siblings that provide queries. If a sibling group provides its own query, Zen recognizes aggregates in that group, and the aggregate value reflects the values returned by the group's query. Then uses the property in a COS expression that constructs an SQL query that defines the resultset which populates the report with data. The orderby attribute provides a comma-separated list of fields that specify how to order the resultset retrieved by the query for this <report> or <group>. It overrides any ORDER BY phrase that is already present in the query, and is useful when you want to change the ordering of the resultset returned by a stored procedure or class and you are not able to rewrite the query for your Zen report. Note that orderby applies sorting on the resultset after it has been retrieved from the table, so the names you use in the orderby string must reflect aliases applied by the SQL SELECT statement. For information on using orderby in the ReportDisplay section of a report, see The orderby Attribute in ReportDisplay in the chapter Displaying Zen Report Data. Any fields listed in the orderby string must already be included in the SELECT phrase for the query for this <report> or <group>. Also, it is not possible to use orderby with a <report> or <group> that has no explicitly defined query. The following example provides a literal value for orderby. In this example, the query is ordered by SalesRep and Customer, rather than by SalesRep and SaleDate as in the original query. If the first character in the orderby string is a ! (exclamation point) then Zen reports interprets the remainder of the string as an ObjectScript expression that provides the string. The following example references a Zen report class property SortOrder to provide a value for the orderby attribute. Because the current class for ObjectScript expressions evaluated in the ReportDefinition block is the report, you can use the double dot syntax to reference the report class property. Note that because the evaluation context is different in the ReportDisplay block, different syntax is required. One way to make the previous example work is to specify the orderby value dynamically when you invoke the report. To do this, apply the ZENURL data type parameter to the corresponding Zen report class property SortOrder, as follows. An InitialExpression value can be helpful, but is not required as long as you supply a value for this property when invoking the report. Once you define SortOrder as shown, you can change the orderby value by invoking the report with a URI like this one. The following sample URI contains a line break for typesetting purposes only; a correct URI is all on one line. To enable the orderby attribute, the Zen report class must have its SQLCACHE class parameter set to 1 (true). This is the default value for SQLCACHE. if '$$$isObject(statement) set pSC=%objlasterror Quit ""
set sql="SELECT Name,Age,FavoriteColors FROM Sample.Person WHERE Name %STARTSWITH ?" The callback method must instantiate new instance of an %SQL.Statement object. The callback then uses the %SQL.Statement.%Prepare method to prepare the SQL statement. The callback method returns a status code by reference to indicate whether or not there were errors encountered in preparing the SQL statement. The required inbound argument pParams is an array that, at runtime, automatically contains any <parameter> values that you supplied in the <report> or <group> definition, such as the value "B" for STARTSWITH in the example above. The callback then uses the %SQL.Statement.%Execute method to create a result set. This resultset then becomes the source of data for the <report> or <group>. The pParams array is subscripted by a 1based number that indicates the order of these parameters in the <report> or <group> definition. The required signature for the method identified by the OnCreateResultSet attribute is different for Zen reports than it is for <tablePane>. For more examples using query parameters, see the section Query Parameters in the Zen Tables chapter of Using Zen Components. sql="SELECT CITY ... FROM ... WHERE STATE=?" The contained group lists all the cities for a state, and then when the state changes it closes the group. breakOnField refers to its containing group, SalesByState, for the same reason that <parameter> refers to its containing group, SalesByCity. The contained item filters the resultset that the container item provides. <group> support the following attributes for grouping records from its parent resultset. If neither break on attribute is supplied for a <group>, no filtering occurs; the <group> processes every record in the resultset from its parent’s query. ObjectScript expression to apply to the value of the field specified by breakOnField. In the expression, %val represents the actual value of the breakOnField field in the resultset record that is currently being processed. For syntax details, see The %val Variable section. Name of a field in the resultset returned by the <report> or <group> that contains this <group>. That is, when looking for a breakOnField value to assign to the nested <group>, you must look one level up, to the parent, to find a field that you can use to organize a nested <group>. If you set the breakOnField attribute for a <group>, the query in the containing <report> or <group> must ORDER BY the field that you identify as the breakOnField for the nested <group>. This is because field breaking examines the resultset sequentially, and creates a break whenever the specified field changes, so if the query is not ordered by the breakOnField, a break may occur unexpectedly in the output for the nested <group>. The following example uses both of the attributes listed in the previous table. This section provides incorrect and correct examples of <group> elements that use breakOnField. One way to make the previous example work is to specify the breakOnField and orderby values dynamically when you invoke the report. To do this, apply the ZENURL data type parameter to the corresponding Zen report class property GroupBy, as follows. An InitialExpression value can be helpful, but is not required as long as you supply a value for this property when invoking the report. Once you define SortOrder as shown, you can change the breakOnField and orderby values by invoking the report with a URI like this one. The following sample URI contains a line break for typesetting purposes only; a correct URI is all on one line. A group is nested when it is inside a <report> or other <group> element. A group’s level refers to how deeply the group is nested from the top of the report definition. Zen reports supports any number of nesting levels. Define a query in the parent group and have the nested group process the resultset returned by the query, including breaking on a field in the query. When processing a group, any data that does not match the break condition is passed to any nested groups. Every <group> (including the outer <report>) defines a query context at that group’s level. If a child <group> does not define a new query, it uses its parent group’s query as if it was its own. References to fields within a <group>, <parameter>, or <attribute> element are resolved by looking at the query one level up from the current element. References to fields within an <element> or <aggregate> element are resolved by looking at the query at the same level as the current element. Groups are siblings when they are contained within the same <report> or parent <group>, at the same level. Sibling groups work only if the Zen report class has its SQLCACHE class parameter set to 1 (true). This is the default setting. If you set SQLCACHE to 0 (false), Zen reports works as before, but throws an error if the report uses sibling groups or elements. Each sibling defines its own query. In this case, the WHERE clause of each sibling often refers to a breaking field from the parent query. The first sibling tests for break conditions and outputs its records, then the subsequent siblings process the same break field. Breaking conditions only apply to the first sibling. The attributes breakOnField and breakOnExpression are ignored for any <group> that is not the first in sequential order among its siblings. The reason for this behavior, is that subsequent siblings receive only the last record from the set defined by the breaking condition in the first sibling. Because subsequent siblings process only one record, breaking conditions are irrelevant. The following example illustrates the first approach. A parent group named company contains two sibling groups, cname and crev. The parent group defines breakOnField=Company. The two sibling groups use the value of Company to look up information about the company for each employee in the resultset provided by the report. The following figure shows the XML output of this report. 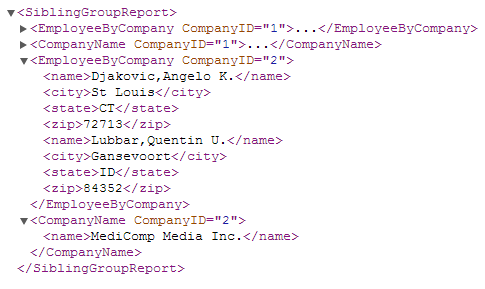 The parent group creates an XML element called company for each company in the resultset. To save space, the XML for the first company is closed in this image, but you can see the results where companyID="2". The report creates elements that provide the company name and company revenue for each employee. The following example illustrates the second approach. The report named SiblingGroupReport contains two sibling groups, EmployeeByCompany and CompanyName. The first group defines the field Company as the breakOnField. It processes all the employee records. When the value of the breakOnField field changes, Zen reports closes the group and passes the last record in the group to subsequent sibling groups. In this example, the second group uses the value of Company in that record to look up the company name. <!-- Second sibling group gets only last employee record. The following figure shows the output of this report. Again, the XML for companyID="1" is closed. You can see that for companyID="2", the report places output for all employees of that company in the element EmployeeByCompany. The element CompanyName contains the name of the company. To correctly process the data results returned by sibling groups, review the rules in the section Building the <report> or <group> Query. Also see the previous section, Nested Groups, and the discussion of sibling elements in the <element> topic. The <group> element in the XData ReportDefinition block supports an ifexpression attribute that lets the user choose at runtime which ZEN Report groups are output. If the value of the attribute is 1, which is the default, the group is generated at runtime. Setting the attribute to 0 suppresses generation of that group and all of its subgroups. You can use a ZENURL property to control the value of the attribute and turn off generation of a group at runtime. "xml"  (the default) Zen reports strip out carriage return (ASCII 13) characters when processing the XML source data for a report. "none"  Zen reports do not strip out carriage return (ASCII 13) characters. All characters are preserved regardless of whether or not the original text contains spaces or newline characters. No XML escaping takes place, and all characters are enclosed in CDATA syntax. "noneifspace"  Zen reports strip out carriage return (ASCII 13) characters when processing the XML source data for a report. Any text that contains line feed or space characters is enclosed in CDATA syntax. "passthru"  Zen reports do not strip out carriage return (ASCII 13) characters. No XML escaping is done. To keep the XML document valid, the XML data inside the element must be valid. For example, every opening element tag such as <foo> must be matched by a closing element tag </foo>. Special newline handling applies only to <element> elements, never to <attribute> elements. XML does not allow attribute values to contain newline characters. The value nodes <element>, <attribute>, and <aggregate> all have the following attributes. (Optional) It can be convenient to conditionally accumulate aggregates for a Zen report. For this reason, value nodes have an accumIf attribute whose value is an ObjectScript expression that evaluates to 0 (false) or nonzero (true). If the accumIf expression for a value node evaluates to false, Zen skips that value node. As a consequence, the value node contributes nothing to the data source for the report. See the section accumIf following this table. (Optional) ObjectScript expression that processes the field value before outputting it. Within the expression you can use the %val variable to represent the actual value of the field. For syntax details, see The %val Variable section. The query inherited by the <group> that contains the <element>. This happens when the <group> that contains the <element> does not provide a query of its own and instead inherits its query from the nearest ancestor <report> or <group>. In this case, the <element> may reference any field in the inherited resultset, just as if the query were defined at the same level as the <group> that contains the <element>. In an expression or filter for the value node, you can use the %val variable to represent the actual value of the field. If the first character in the field string is a ! (exclamation point) then Zen interprets the remainder of the string as an ObjectScript expression that provides the string. See the section Field following this table. fields is similar to field, but consists of a comma-separated list of one or more fields from the resultset. In an expression or filter for the value node, you can refer to these fields using the %val variable subscripted with their case-sensitive names as listed in fields. filter Not all value nodes support the filter attribute. <element> and <attribute> support filter; <aggregate> does not. For information about filter, see the individual value node descriptions. If the supplied name is an invalid string for use as an XML identifier, an error results when you attempt to compile the Zen report class. The most obvious characters to avoid are any white space characters, plus the five standard XML entity characters &'<>"
In this example, there are two possible values for Flood: "Y" and "N" indicates whether or not the property is in a federally designated flood zone. For each of these values, the <aggregate> calculates the value of insured policies in the Northeast region. One way to make the previous example work is to specify the field, breakOnField, and orderby values dynamically when you invoke the report. To do this, apply the ZENURL data type parameter to the corresponding Zen report class property GroupBy, as follows. An InitialExpression value can be helpful, but is not required as long as you supply a value for this property when invoking the report. Once you define GroupBy as shown, you can change the field, breakOnField, and orderby values by invoking the report with a URI like this one. The following sample URI contains a line break for typesetting purposes only; a correct URI is all on one line. The <element> element is valid within a <report> or <group> in an XData ReportDefinition block. 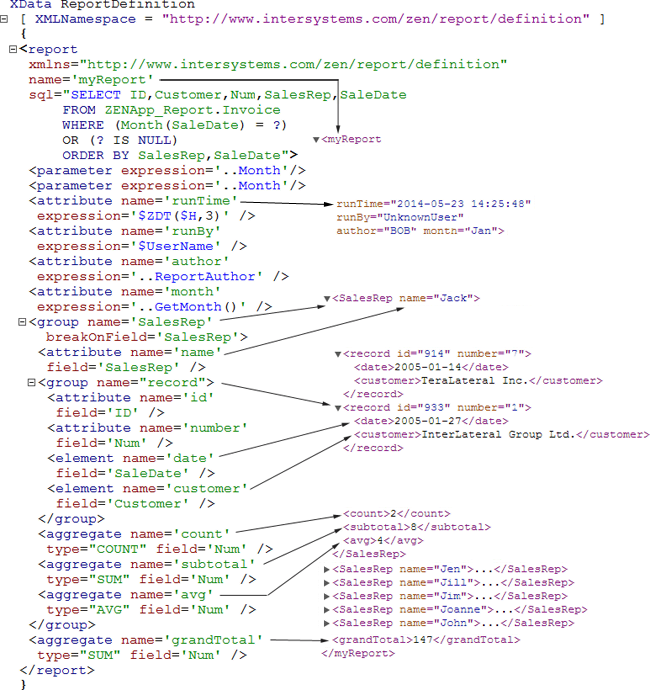 Each <element> adds an XML element to the XML data definition for the report. <element> has the following attributes. "xml"  (Default) The text is XML escaped. This means that spaces are visible in the XML source, but do not appear in the display unless you set the literalSpaces attribute for the corresponding <item>. Zen reports strip out carriage return (ASCII 13) characters when processing the XML source data for a report. "none"  All characters are preserved regardless of whether or not the original text contains spaces or newline characters. No XML escaping takes place, and all characters are enclosed in CDATA syntax. Zen reports do not strip out carriage return (ASCII 13) characters. "noneifspace"  Any text that contains line feed or space characters is enclosed in CDATA syntax. Zen reports strip out carriage return (ASCII 13) characters when processing the XML source data for a report. "passthru"  No XML escaping is done. To keep the XML document valid, the XML data inside the element must be valid. For example, every opening element tag such as <foo> must be matched by a closing element tag </foo>. Zen reports do not strip out carriage return (ASCII 13) characters. A string that indicates the type of data retrieved by the element. The value of the fieldType attribute is either "literal" (which is the default) or "stream". When the fieldType is "stream", the element field must retrieve a stream, or run-time errors result. When the fieldType is "stream" you cannot use the expression attribute or %val. If you want to process the OID using %val let fieldType be "literal", which is the default. The <element> escape attribute can be used to determine how the stream is translated, for instance whether < is transformed to less than entity. ObjectScript expression that may or may not evaluate to 0 (false). When the filter expression evaluates to 0, Zen skips processing this <element>. As a result, no output from this <element> appears in the XML data for the report. For details, see The %val Variable section. If you are generating an Excel spreadsheet from a Zen report, you can use the excelName attribute to provide a string to use as the header for the column generated from this <element>. If excelName is null, the column header comes from the name attribute. The excelName attribute supports localization. See Localizing Zen Reports. If you are generating an Excel spreadsheet from a Zen report, you can use the excelNumberFormat attribute to provide a string that tells Excel how to format the number. This attribute is used only when generating an Excel spreadsheet in xlsx mode, and when EXCELMODE is set to element. See Numbers, Dates and Aggregates. By default, the value supplied by an <element> is interpreted as text in the generated Excel spreadsheet. If you set the attribute isExcelDate="true", the value is interpreted as a date in Excel. The date must be in Excel date format, which is the date display format for fetching via SQL when %DATE or a %TIMESTAMP are present and runtimeMode="1" (ODBC mode). If Excel cannot interpret the value as a date, you see an error when Excel tries to open the generated spreadsheet. See Numbers, Dates and Aggregates. By default, the value supplied by an <element> is interpreted as text in the generated Excel spreadsheet. If you set the attribute isExcelNumber="true", the value is interpreted as a number in Excel. If Excel cannot interpret the value as a number, you see an error when Excel tries to open the generated spreadsheet. See Numbers, Dates and Aggregates. By default, the value supplied by an <element> is interpreted as text in the generated Excel spreadsheet. If you set the attribute isExcelTime="true", the value is interpreted as a time in Excel. The time must be in Excel time format, which is the time display format for fetching via SQL when %DATE or a %TIMESTAMP are present and runtimeMode="1" (ODBC mode). If Excel cannot interpret the value as a time, you see an error when Excel tries to open the generated spreadsheet. See Numbers, Dates and Aggregates. A <group> may be a sibling of another <group>. There is an extended discussion of Sibling Groups in the section about the <group> element. An <element> may also be a sibling of one or more <group> elements at the same level of the XData ReportDefinition block. When this is the case, the <group> that is sequentially the first sibling group at that level has special significance for each <element> and <group> at that level. This <group> is called the collegial group for that level. Elements work as siblings of groups only if the Zen report class has its SQLCACHE class parameter set to 1 (true). This is the default setting. If you set SQLCACHE to 0 (false), Zen reports works as before, but throws an error if the report uses sibling groups or elements. Suppose an <element> and a <group> are siblings. Any <group> at this level gets its data either from its own query, or from the query defined by its next nearest ancestor <report> or <group>. There is much more detail about this in the Building the <report> or <group> Query and Break On Field or Expression sections of the <group> documentation in this chapter. Meanwhile, any <element> at the sibling level gets its data from the field whose containing row in the resultset satisfies the break condition of the collegial group. If an <element> has no collegial group, its contents in the XML output consist of the value of the identified field for each row in the resultset, even if these are not distinct values. The <attribute> element is valid within a <report> or <group> in an XData ReportDefinition block. Each <attribute> adds an attribute to the XML data definition for the report. This attribute modifies the element output by the <report> or <group> that contains the <attribute>. An element can contain text content, but cannot contain attributes. A group can contain attributes and elements, but cannot contain text content. <attribute> has the following attributes. ObjectScript expression that may or may not evaluate to 0 (false). When the filter expression evaluates to 0, Zen skips processing this <attribute>. As a result, no output from this <attribute> appears in the XML data for the report. The <aggregate> element performs a calculation over every record in the resultset returned by the query associated with a <report> or <group>. The result becomes the contents of a node in the XML data for the report. <aggregate> has the following attributes. If the type is CUSTOM, the class attribute must specify the package and class name of a class that extends %ZEN.Report.CustomAggregate. There are several built-in aggregate classes that you can reference. For details, see the list of Built-in Aggregate Classes following this table. Specifies that this aggregate should be an Excel formula in the generated spreadsheet. The value must be the name of the Excel formula equivalent to the type of the aggregate. See Numbers, Dates and Aggregates. When you use a Zen report to generate an Excel spreadsheet, aggregates are often positioned at the bottom of a column generated by elements in the ReportDefinition. In this case, the aggregate uses the column header generated by the element. You can generate an Excel spreadsheet from a report that has aggregates, but no elements. In this case, the default value for the column header comes from the name attribute. You can also use the excelName attribute to provide a string to use as the column header for this <aggregate>. See Numbers, Dates and Aggregates. The excelName attribute supports localization. See Localizing Zen Reports. Supports conditional inclusion of the aggregate. When the filter evaluates to 1 the report includes the aggregate in the output. When the filter evaluates to 0 the report does not include aggregate. The filter expression can use the special variable %val, which contains the value of the aggregate. ObjectScript expression that formats the output from this aggregate. The format expression can use the special variable %val, which contains the value of the aggregate. Used only when the runtime mode is DISPLAY (2). If set to 1, do not perform any National Language Settings processing for this aggregate. If set to 0, perform NSL processing. If null (""), ignoreNLS takes its value from the value of the parameter AGGREGATESIGNORENLS . The default value is "". See National Language Settings for Aggregates. Used only when the runtime mode is DISPLAY (2). If set to 1, perform postprocessing of the aggregate result for National Language Settings. If false, do not perform postprocessing. If null (""), the value of this attribute is set to 1 during report generation. The default value is "". See National Language Settings for Aggregates. Used only when the runtime mode is DISPLAY (2). If set to 1, perform preprocessing of the aggregate value for National Language Settings. If false, do not perform preprocessing. If null (""), the value of this attribute is set to 1 during report generation. The default value is "". See National Language Settings for Aggregates. Zen reports supports National Language Settings (NLS) when calculating aggregates. NLS support is controlled by the parameter AGGREGATESIGNORENLS, and the properties ignoreNLS, preprocessValue, and postprocessResult. The default value of AGGREGATESIGNORENLS is true (1), and the default value of all the properties is null (""). In the default case, the ignoreNLS property for each aggregate takes its value from AGGREGATESIGNORENLS. It is set to 1, and the report ignores National Language Settings. To apply NLS to aggregates in a report, set AGGREGATESIGNORENLS to false (0). You can also control NLS processing on a per-aggregate basis by setting the value of ignoreNLS, which overrides the value of AGGREGATESIGNORENLS. Numeric XSLT functions only honor the US locale. For this reason, an aggregate does not display properly if it uses XSLT functions that have numeric floating point arguments, and National Language Settings that use commas to separate decimal values. When you create a report with the runtime mode set to DISPLAY (2), and Caché is using NLS, the input values used to calculate the aggregate must be converted from their NLS format to a format that can be used by the COS code that does the calculation. Once the aggregate has been calculated, it must be converted from the format produced by COS to a format consistent with the National Language Settings in use. Support for NLS is implemented by methods in the base aggregate class %ZEN.Report.aggregate. If AGGREGATESIGNORENLS is false (0), these methods pre-process values or post-process results according to the National Language Settings in use. You can extend the base class and define whatever pre- and post-processing methods you need. If the report is using NLS, and the value of preprocessValue, or postprocessResult is null (""), it is changed to 1 during report generation. You can override this behavior by explicitly setting the value of either preprocessValue, or postprocessResult to 1 or 0. If the report is ignoring NLS, the value of these properties is ignored, and the report never calls the methods that perform NLS processing. All of the standard and shipped custom aggregates provided by Zen reports work transparently with NLS when AGGREGATESIGNORENLS is false (0). If you need to define a custom aggregate, and the custom aggregate needs to work with National Language Settings, use the aggregates defined in Zen reports as a template. Returns the correlation coefficient between two sets of values. Returns an empty string if the denominator would be zero. Returns the number of distinct values in a set of data, as opposed to a simple COUNT. Returns the statistical covariance of the values processed. This is a measure of the degree to which two variables change together. See the description of %ZEN.Report.Aggregate.LinearRegression. Returns the coefficient of determination, which provides a measure of how well future outcomes are likely to be predicted by the statistical model. Returns the statistical variance of the values processed for linear regression. Returns the median of a set of numerical data, as opposed to a simple AVG (average). The median is a number with half of the data set of greater value than it, and half of lesser value. For a data set with an odd size, the median is a member of the data set. For a data set with an even size, the median is a value halfway between two members of the data set. Returns the statistical mode (most frequent observation) of a set of data. Returns the standard deviation of the values processed. This is the unbiased standard deviation using Bessel’s correction of n - 1 in the denominator rather than n.
Returns the biased standard deviation of a whole population of values provided. Returns the statistical variance of the values processed. This is square of the unbiased standard deviation. Returns the biased statistical variance of a whole population of values provided. The name myaggregatename must be unique in the XML namespace. If you need to provide parameters to the aggregate, define them as properties of the class. GetResult is invoked once all records have been processed to return the final value of the aggregate. ProcessValue is called sequentially on each record returned by the report or group query. You may use the single-valued or multidimensional special variable %val inside these methods. You can reference this aggregate in a report, using myaggregatename as the element name. You can pass parameters to the aggregate as attributes. You do not need to provide the type or class attributes. The following example creates two custom aggregate classes, called me.MultiDimAggregate andme.ParameterizedAggregate, and uses them in a report. /// Return the count of names and states that begin with "A"
The class me.ParameterizedAggregate uses the %ZEN.Report.Datatype.string datatype for the FieldToCount property. The value of a property having this datatype must be the name of a field in the result set. This datatype supports the parameter REPORTFIELD, which triggers special processing, feeding the value of FieldToCount into a subscript of the %val special variable. The value of the field specified by FieldToCount is passed to %val as data at that subscript. For other properties, use datatypes from %ZEN.Datatype package or other datatypes as desired. The second is an aggregate of the custom type defined in me.ParameterizedAggregate. Note that the value passed in the exclude attribute is a Zen expression. The third is an aggregate of the custom type defined in me.MultiDimAggregate. Note that the value of the expression attribute is %val . In this case, %val is passed to ProcessValue by reference. In other words, the aggregate passes .%val. This gives the ProcessValue method access to the multidimensional array called %val. The URI of any valid XML document. Relative URIs are handled with respect to the current URI. An empty string. In this case, the class generates its own XML document using the specification in its XData ReportDefinition block. If a Zen report class has both a non-empty, valid DATASOURCE string and an XData ReportDefinition block, the DATASOURCE parameter takes precedence over the XData block. When a Zen report identifies a DATASOURCE, it ignores EMBEDXSL or $EMBEDXSL. You cannot use embedded XSLT with a data source. The report property suppressRootTag can be useful with DATASOURCE if the data source includes its own root tag. A user can override the current DATASOURCE setting for the report class by providing a $DATASOURCE parameter in the URI when invoking the Zen report from a browser. If you are invoking the report from the command line using the GenerateReport method, Zen reports looks for the data source files in the same location as it does when the report is run in a browser. Writing XML Statements From a Class Method  Use the coding language of your choice. <call>  Includes XML generated by a called method and returned as a stream. Note: <call> can be used only in a <report>, not in a <group>. <include>  Includes literal XML statements from an XData block. <get>  Includes XML statements generated by the XData ReportDefinition block from another Zen report. You can write XML statements from a class method in the language of your choice, then reference this method from the XData ReportDefinition block in the Zen report class using the call and callClass attributes on the top level <report> element. In this case, there is no need for your XData ReportDefinition block to provide statements that generate an XML data source. Instead, your XData ReportDefinition block consists of a single <report> element that provides a call and (optionally) a callClass attribute. WRITE !,"some text for a text node"
If the method is in some other class in the same Caché namespace, Zen can find it if you supply a callClass attribute in addition to call. The value of the callClass attribute must be the full package and class name of the class that contains the call method. If not supplied, the default is the class in which the <report> or <group> appears. The callArgument attribute supplies an argument to the method specified by the call attribute. Both <report> and <group> support the call, callClass, and callArgument attributes. If you specify the call attribute on the <report> element, the XML statements written by the class method comprise the complete source data for the report. If you specify the call attribute on the <group> element, the class method provides a portion of the source data for the report, positioned where the <group> element is located in the <report>. The <call> element calls a method that returns a stream, and inserts the stream into the report definition at the place where the call element occurs. The stream must be well-formed XML. This capability allows a report definition to incorporate XML created by the XData ReportDefinition block of another report. It is useful if you want to create a report from separately developed subreports, or if a report becomes too large to compile. The <call> element must be a direct child of <report>. A called subreport cannot contain a <call> element. If true, the method returns a status value by reference in last parameter to method. A class or instance method which returns a stream. This method must be defined in the Zen report. The stream is inserted into the report definition at the place where the call element occurs. The method can return the output of the XData ReportDefinition block of a subreport, or it can perform other functions. If used with a subreport, the method must create a new instance of the subreport, and use GenerateStream to return a stream. For methods called from the XData ReportDefinition block, the mode argument to GenerateStream is always 0 (XML), which is the default. A different <call> element is used in the XData ReportDisplay block. For help resolving problems with the <call> element, see Troubleshooting the <call> element. The method GetSub creates a new instance of MyReport.cls and generates a stream containing the output of the XData ReportDefinition block. This stream is placed in the XML generated by MyReportMainDef.cls, at the point where the <call> element is placed. The second argument to GenerateStream supplies the mode, which is always 0, indicating XML, when you call the method from ReportDefinition. The section XData ReportDefinition in the chapter Gathering Zen Report Data discusses the structure of the XML generated by the XData ReportDefinition block. As this figure shows, the top-level element in the generated XML comes from the name attribute of the report element. When the ReportDefinition block uses <call> to add XML from a subreport, the top-level element of the subreport becomes an immediate child of the top-level element of the report. The XData ReportDisplay block in MyReportMainDef.cls formats the report, which produces a summary instead of the detailed report produced by MyReport.cls. The name attribute of the <report> element must match the name used in the ReportDefinition block. You must also add a <group> element to the ReportDisplay block, as an immediate child of the <body> element. The name attribute of this <group> must match the name attribute of the <report> element of the subreport. When you use a parameter field or expression, one that requires the setting of a field, then the field used is from the last row of the surrounding group or report, depending on where the call is nested. This is a subtle point that can cause unexpected results. Like <element>, <callelement> can take filter, expression, field and fields attributes. It is aware of the data context where it is used, and repeats for each record in the calling SQL. Unlike <element>, it calls a method, passes the value of expression, or the value of field if there is no expression, to the called method. Like the <call> element, <callelement> puts the output of the method in the generated XML at the place where the element occurs. When you use <callelement>, you are responsible for ensuring that the outputted stream contains properly-escaped values. Be aware that the escaping selected by the escape attribute is applied to the data values before they are passed to the <callelement>'s method. So, if you are entering COS expressions or values, you may wish to set escape="passthru". You must determine whether or not XML-escaping is desired on a case-by-case basis. <callelement> has the following attributes. Browsers generally remove what they regard as excess white space from pages that they display. Therefore, if you want to retain white space characters in the output you must use the escape attribute. Note that the escape style is applied to the data values before they are passed to the method specified for the <callelement>. "passthru"  No XML escaping takes place. To keep the XML document valid, the XML data inside the element must be valid. For example, every opening element tag such as <foo> must be matched by a closing element tag </foo>. Zen reports do not strip out carriage return (ASCII 13) characters. Optional ObjectScript expression that can either be applied to the value of this item, supplied as %val, or provide an arbitrary value for this item. If present, this value is sent to the called method. Also see Value Node Attributes. field Name of the field (column) in the base query for this report that supplies the value for this item. If this starts with a ! (exclamation point) then this is an expression that evaluates to field name. If there is no expression, this value is sent to the called method. fields Name of fields (columns) in the base query for this report that supply the values for this item. ObjectScript expression that may or may not evaluate to 0 (false). When the filter expression evaluates to 0, Zen skips processing this <callelement>, and as a result, no output from this <callelement> appears in the XML data for the report. method Name of a method that returns an XML stream. The stream is included in the generated XML at the location where the <callelement> element occurs. The output of the method must be well-formed XML. The method can call a Zen report with information from the field or expression, but it does not have to. It can modify the data passed to it to produce well formed XML. where (Theater = ?) order by StartTime"
The ReportDisplay block formats the resulting XML into a report that lists each theater and the films showing there sorted by show time. You can place a set of XML statements into an XData block in your Zen report class or in any other class, and then reference that XData block from an XData ReportDefinition using the <include> element. Doing this inserts the contents of your XData block into the generated XML data source for the report. The report property suppressRootTag can be useful with <include> if the included data has its own root tag. class Package and class name of the class that contains the XData block to be included. If not supplied, the default is the class in which the <include> element appears. xdata Name of the XData block. This name is case-sensitive. You can place a set of ReportDefinition building-blocks into an XData block in your Zen report class or in any other class, and then reference that XData block from an XData ReportDefinition using the <macrodef> element. You must also set Parameter SUPPORTMACROS=1;. Doing this inserts the contents of your XData block into the ReportDefinition for the report. The XML inserted by <macrodef> is interpreted as if it had been entered directly in the ReportDefinition. class Package and class name of the class that contains the XData block to be included. This attribute is required. The XML output by the modified report exactly duplicates the XML output by the original report. 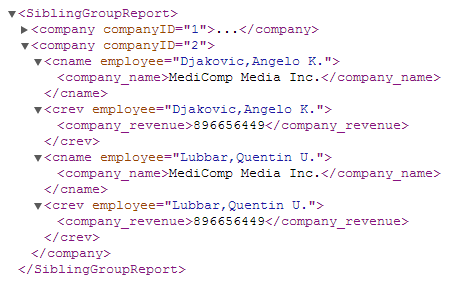 It is useful to be able to include the generated XML from one report in a group generated by another report. This way you can combine the results of various Zen reports into a master report. This gives you flexibility and simplicity since each report does one thing well. Use the <get> element to reference the XML statements generated by the XData ReportDefinition block in another Zen report class. <get> has the following required attributes. host Host name, usually the host name for the Caché installation or localhost. port Port number, usually the Web server port number for the Caché installation. url Taken together, the host, port, and url attributes identify where to get a block of XML statements to include in the XML data source for the report. The url string provides the remainder of a URI string that begins with host and port. $MODE=xml is required if the url value identifies a Zen report class. $MODE=xml specifies that the desired output format is XML. $STRIPPI means strip processing instruction and a value of 1 means true. $STRIPPI=1 is appropriate if the XML source identified by the url value begins with the usual <?xml version="1.0"?> processing instruction. This is the case for XML output created by a Zen report class with $MODE=xml. If you are using <get> to insert an XML block inside another XML block, it makes sense to strip out the <?xml version="1.0"?> instruction. If you do not, Zen inserts it into the middle of the containing block when it performs the text substitution indicated by the <get> element. You can generate a complete Zen report class, including the XData ReportDefinition block that defines its XML data source, by asking the Zen report generator to generate a Zen report class from an ordinary ObjectScript class that has a query defined in it. The resulting Zen report has default layout and styling which you can adjust by editing the generated Zen report class. You can also use the GenerateForSQL() method to generate a Zen report class from an SQL query, by providing the query instead of the name of a class that contains the query. Set xmlstylesheet, which is a property of %ZEN.Report.reportPage. This property specifies a stream containing the contents of the stylesheet. If xmlstylesheet is null, Zen reports looks for a method specified with the property getxmlstylesheet. This method returns the contents of the stylesheet as a stream. You can define an xmlstylesheetarg whose ZENURL is $XMLSTYLESHEETARG and this argument is passed to the getxmlstylesheet method. 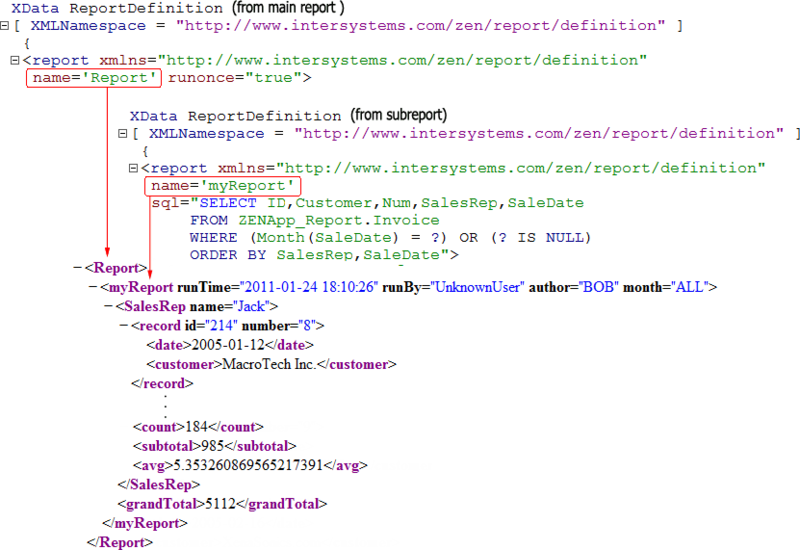 If getxmlstylesheet is null, Zen reports looks for the parameter XMLSTYLESHEET. This parameter specifies an absolute or relative URI that points to a location whose contents are an XML stylesheet. If you provide a relative URI, the file must be located in csp/namespace in the Caché installation directory. The file can be either an .xsl file or a .csp file.